U.S. equities are under pressure on Monday — led by weakness in Big Tech stocks like Apple Inc. (NASDAQ:AAPL), Amazon.com, Inc. (NASDAQ:AMZN) and Netflix, Inc. (NASDAQ:NFLX) — as investors grow increasingly concerned about rising tensions between President Donald Trump and North Korea. North Korea’s foreign minister said Trump’s comments over the weekend amounted to a declaration of war and threatened to shoot down U.S. bombers in international airspace. The warning comes after a package of B-1 bombers and F-15 fighters flew near North Korean airspace on Saturday. Trump has yet to respond on Twitter. But obviously, the threat of an attack on American warplanes in international airspace is a serious escalation of the war of words that’s been simmering for months. Add in tensions over an independence referendum in northern Iraq — with the possible threat of military action by Baghdad — and Wall Street suddenly has a couple of reasons to be worried. 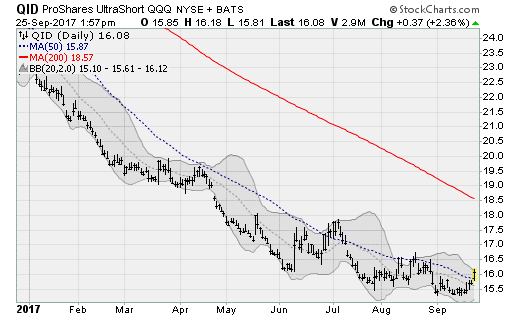 The ProShares UltraShort QQQ (ETF) (NYSEARCA:QID), which returns twice the inverse of the Nasdaq 100, is perking up 2.4% off of three-month lows Monday. The underlying Nasdaq 100 is heavily skewed toward mega-cap tech stocks like AAPL and Microsoft Corporation (NASDAQ:MSFT), both of which are suffering from sharp pullbacks this morning. NFLX stock is among the hardest hit, down 5.2% in mid-day trading. 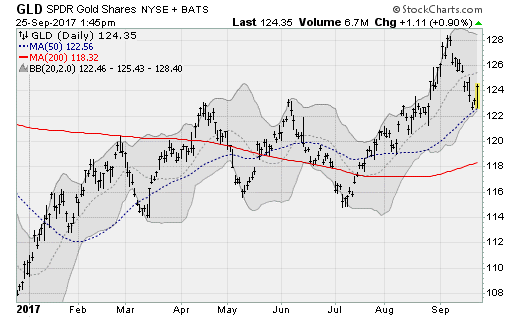 The SPDR Gold Trust (ETF) (NYSEARCA:GLD) fund, which offers quick and easy exposure to gold bullion, is bouncing nicely off of its 50-day moving average in early trading Monday. While precious metals have been on the move higher since July when tensions with North Korea first warmed up, they suffered a bout of weakness in September as the U.S. dollar stabilized. Adding to the pressure was hawkishness from the Federal Reserve, which announced the start of “quantitative tightening” last week and hinted at another rate hike in December. But with the threat of conflict with Pyongyang on the rise again, gold is enjoying a bid. The situation in the Kurdish region of northern Iraq — a major energy producing area — has pushed crude oil prices up and over three-month overhead resistance lifting the United States Oil Fund LP (ETF) (NYSEARCA:USO) fund above its 200-day moving average for the first time since April. The rise caps a 20% move off of the June low. The concern is that any military response from Baghdad or Turkey following the independence referendum vote today could jeopardize energy producing infrastructure, tightening supply at a time when OPEC is maintaining its output freeze agreement first teased in early 2016 and signed late last year. The lift underway in energy markets is helping drive interest in the energy sector, specifically exploration and production names, on the hopes a possible supply disruption in Iraq will bolster drilling and pumping activity. 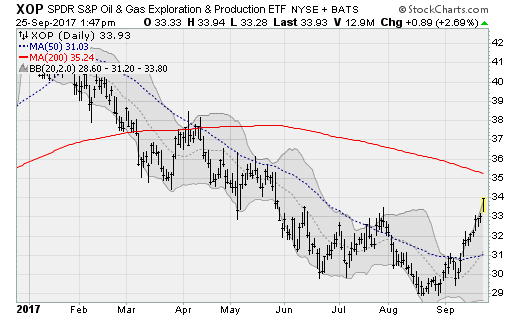 The SPDR S&P Oil & Gas Explore & Prod. 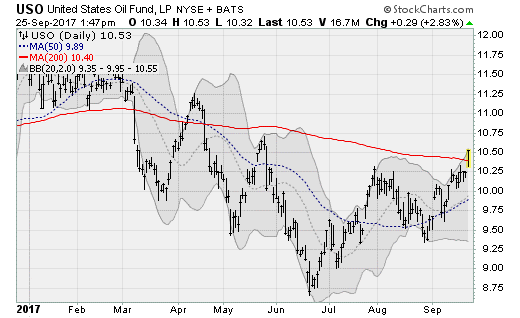 (ETF) (NYSEARCA:XOP) fund, which maintains positions in companies including Rice Energy Inc (NYSE:RICE) and HollyFrontier Corp (NYSE:HFC), is testing highs not seen since late May up 17% from its late August low. Merely a return to the early April high near $38 would be worth a 12% gain from here. 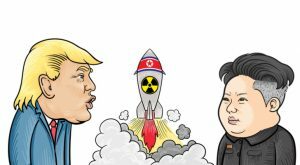 Article printed from InvestorPlace Media, https://investorplace.com/2017/09/4-etfs-to-buy-as-north-korea-threatens-war/.